There’s been a change in the way the ValidateRequest attribute on WebForms works in ASP.NET 4.0. I noticed this today while updating a post on my WebLog all of which contain raw HTML and so all pretty much trigger request validation. I recently upgraded this app from ASP.NET 2.0 to 4.0 and it’s now failing to update posts. At first this was difficult to track down because of custom error handling in my app – the custom error handler traps the exception and logs it with only basic error information so the full detail of the error was initially hidden. <%@ Page Language="C#" AutoEventWireup="true" CodeBehind="NewEntry.aspx.cs"
Kudos for the ASP.NET team for putting up a nice error message that tells me how to fix this problem, but excuse me why the heck would you change this behavior to require an explicit override to an optional and by default disabled page level switch? You’ve just made a relatively simple fix to a solution a nasty morass of hard to discover configuration settings??? The original way this worked was perfectly discoverable via attributes in the page. Now you can set this setting in the page and get completely unexpected behavior and you are required to set what effectively amounts to a backwards compatibility flag in the configuration file. It turns out the real reason for the .config flag is that the request validation behavior has moved from WebForms pipeline down into the entire ASP.NET/IIS request pipeline and is now applied against all requests. However, we recommend that you analyze any request validation errors to determine whether existing handlers, modules, or other custom code accesses potentially unsafe HTTP inputs that could be XSS attack vectors. Ok, so ValidateRequest of the form still works as it always has but it’s actually the ASP.NET Event Pipeline, not WebForms that’s throwing the above exception as request validation is applied to every request that hits the pipeline. 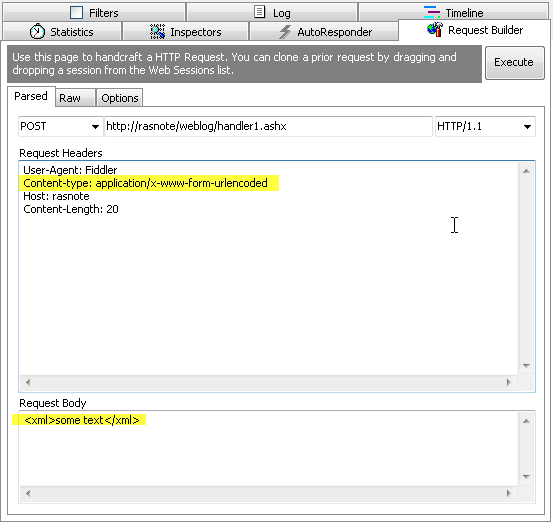 Creating the runtime override removes the HttpRuntime checking and restores the WebForms only behavior. That fixes my immediate problem but still leaves me wondering especially given the vague wording of the above explanation. One thing that’s missing in the description is above is one important detail: The request validation is applied only to application/x-www-form-urlencoded POST content not to all inbound POST data. and sure enough – hitting the handler also causes the request validation error and 500 server response. That probably should trigger event validation – since it is a potential HTML form submission, but it doesn’t. New Runtime Feature, Global Scope Only? Thanks for the detailed post and information. Regarding the part about this functionality being restricted to "application/x-www-form-urlencoded POST" requests: are you sure about this? I seem to remember that I ran into this on a simple GET request which had illegal characters in the URL. I don't have time to verify this right now, but was wondering whether you would know anything about it. When I do revisit this I'll be sure to post back here. I agree with Martin - I've just tested a very simple ASP.NET 4.0 page passing HTML in the query-string, and got: "A potentially dangerous Request.QueryString value was detected from the client". 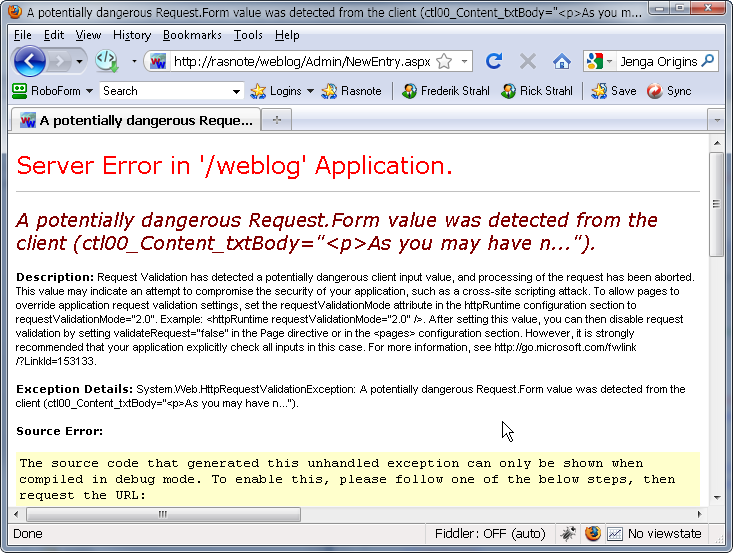 This happens even if I set the ValidateRequest attribute to false. Rick... thanks for posting the same thoughts I had. When we ran into this and investigated it I was surprised the only way I could disable request validation for a specific page was to downgrade to ASP.Net 2.0 request validation. Rick, this is a great post, keep it up! Thanks for the post Rick - this clarifies things some more. I'm trying the fix that allow validation to be switched off, i.e. adding <httpRuntime requestValidationMode="2.0" /> to our root web.config. It works fine on my local development machine, however I still get the validation errors on our test web server. Both machines have .NET 4.0 installed, and the application I'm testing is configured as .NET 4.0 on my local machine and the test server. The only difference in these environments is that my local machine is running IIS 5.1, and the test server is running IIS 6.0. Has anyone come across this issue? What happens if you the AJAX HTML Editor is used to dress up text that is then saved in a DB? I had played with it a while back and discovered that it saves the text using typical HTML-related tags. Thanks! this is a great post, keep it up! Rick - I love this article and your final conclusion. I must say that the best statement in your article is "WTF?". I do not know how many times I have uttered this same statement when trying to code in asp.net. I had come across this situation while designing a webpage few months back that had Rich Text Editor box and I fixed it the way you shown in by modifying the web.config file. However I didin't digged more into why it was happening. Your post clarified it now. Wondering if that would downgraded all aspx pages of my website to 2.0 as it is being specified in the web.config file thats really not good. I tried to set a page level requestValidationMode but I think it is not doable, if any body knows please suggest. Anyways as always great post, keep it up! The above is with RequestValidation in force. Examples: if you encode '<d' ... no go! if you swap '<' or & with certain 3 character sequences and of course, decoding code galore on the server side... wow... things can be made to work... but the code is horrendous. Don't know, show me what I am missing.